We’re in to 2018! Happy New Year everyone, we hope you had a wonderful festive break! Now that all the celebrations are over and the decorations are down, we thought we’d share a great little look back at some of the most interesting properties on Rightmove from 2017. Over the year, Rightmove track things like the most viewed properties and homes that look the most interesting/quirky. Last year with the housing market being buffeted by political and economic factors it’s great to see some of the fantastic properties for sale across the country. From Lighthouses to Shakespearean mansions – there’s so much variety. The most viewed property on the whole UK web portal was an 11 bedroom Alderley Edge mansion – a truly stunning property. There was also a detached three-bedroom property in the Outer Hebrides for those misanthropes wanting panoramic views of the Atlantic Ocean as well as the obligatory Kensington Mansion. Take a look at the full list on the Rightmove website. Where do you want to be during the cold, dark winter months? Obviously your first choice might be somewhere sunny and warm but, failing that a cosy living room with an open fire can be pretty appealing. There is nothing more British than hunkering down for our unpredictable winters. Rightmove’s cosiest properties range from character cottages to Ski Chalets in the mountains – you can read the full article online. Rightmove had some rather unusual listings in 2017. Gone are the days of the standard four walls and a roof – we now see some amazing conversions and re-purposing projects coming to the fore. Do you miss the commute to work? Well you can pick up your very own bungalow, complete with train carriage rooms. Talking of transport – there are even stunning houseboats moored at Limehouse in London for those of you with a penchant for the nautical. Take a look at the full article – it’s fascinating! There are some truly incredible properties around. Rightmove have put together a list of properties that really have the wow factor! 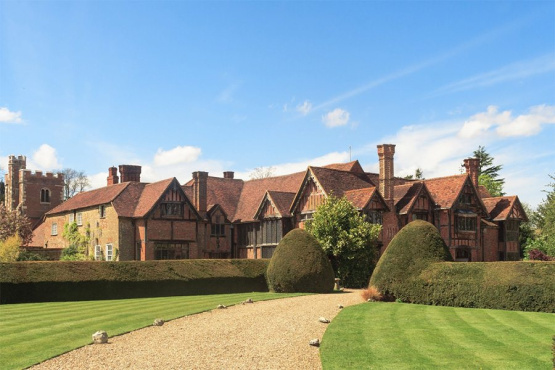 We are very lucky to live and work in one of the most sought after locations in the south east and there are some truly stunning properties locally. However, some of these properties wouldn’t look out of place in a Disney fairy tale. In 2017 there was even an island for sale, that’s right an entire island off the coast of Menorca! Castles and mansions with mazes – this list really has got it all! So, what are your plans for 2018? What does this year hold for you? Perhaps you are thinking of selling your property or indeed, moving to the area. Whatever your direction make sure you get in touch with your multi-award winning estate agent in Beaconsfield and the surrounding area. You can call us on 01494 680018 or send us an email. Remember you can also follow us on Facebook and Twitter for all the industry and local news. *the house in the photo is not/was not for sale at the time of writing.